Authorized by the Texas Legislature in 1899, Southwest Texas State Normal School opened its doors in 1903. 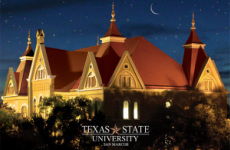 Over the years, the Legislature broadened the institution's scope and changed its name, in succession, to Normal College, Teachers College, College, Southwest Texas State University, and in 2003 to Texas State University-San Marcos. Each name reflects the university's growth from a small teacher preparation institution to a major, multipurpose university. Texas State's original mission was to prepare Texas public school teachers. It became renowned for carrying out this mission, but today it does far more. For more information, visit http://www.txstate.edu.